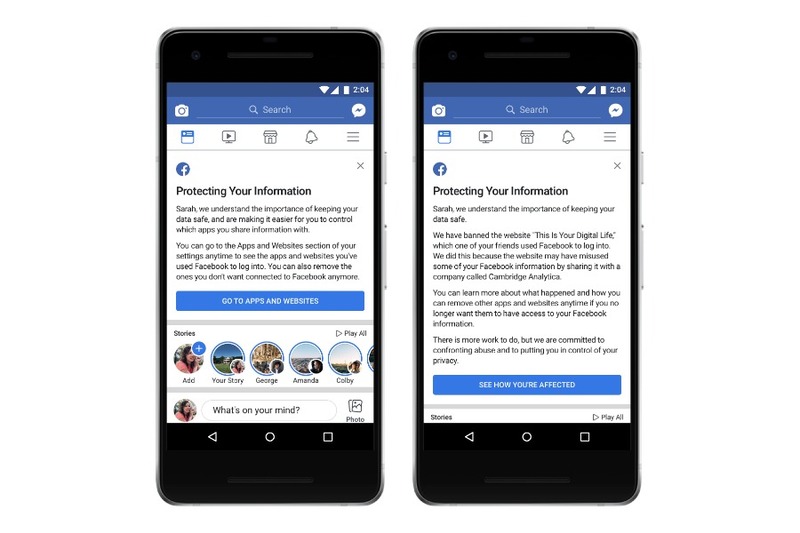 Today, Facebook will be rolling out a feature to help you check to see if your data, along with around 87 million other people, was stolen by Cambridge Analytica. While we haven’t seen anything on our own Newsfeeds yet, here’s what to keep an eye out for if you want to check. Related: How to figure out (and change) which categories Facebook has assigned to you. Take a look at the image above. If your data has not been affected, your Facebook Newsfeed will look like the image on the left. If your data has been affected, you’ll see something similar to the image on the right. Both will have links to help you check which 3rd party apps are connected to your account, which we’ve already shared here on Cool Mom Tech. Whether or not your data has been compromised, it’s a good time to check all your privacy and security settings, as well as remove any 3rd party apps you don’t want connected to your account. Or and if you’re ready to quit Facebook altogether, we’ve got some information to help you make an informed decision. Updated: You can head to Facebook to check to see if you’ve been affected by the Cambridge Analytica data breach. Make sure you’re logged in!